After almost a year of separation, it's still hard to let go, I guess. Just two weeks ago, Kris Jenner filed for divorce from Bruce Jenner citing "irreconcilable differences" and it wasn't a surprise to anyone. And soon after, Bruce filed "nearly identical" divorce papers of his own. The Keeping Up with the Kardashians matriarch and patriarch had been living apart for 11 months at the time and while they remained amicable, they clearly weren't getting back together. 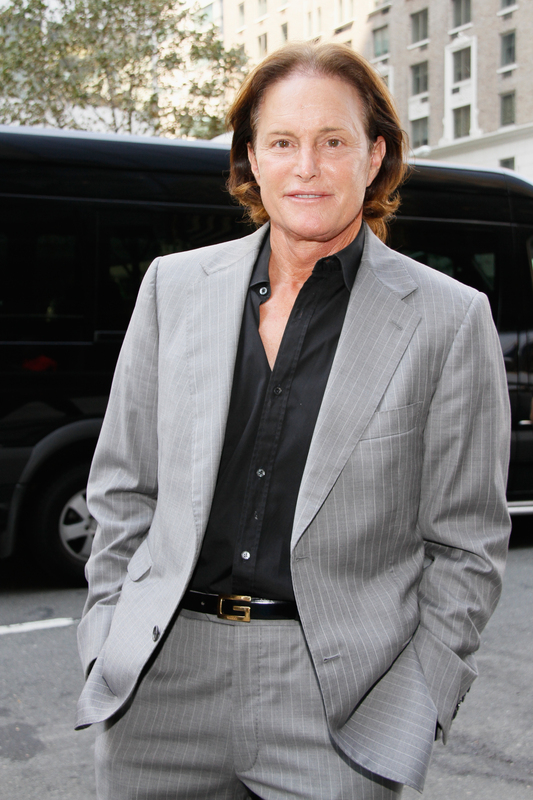 This it what makes it a little confusing that Bruce Jenner is still wearing his wedding ring. On Oct. 4, the athlete was seen wearing a ring on that finger at the Elton John concert at the Staples Center. Maybe Bruce wasn't ready to say goodbye, even though we're all ready to see him on a new reality show. There are some interesting things going on with the photos of Bruce from this concert, which he attended with his son, Brandon, and daughter-in-law, Leah. First, there are so many photos of him with his hands shoved deep into his pockets in almost an uncomfortable way, as if he's trying to hide something. (Which is obviously the wedding ring, but why?) And then there are a handful of photos where Bruce allowed his hands to swing freely in plain sight. So, what gives? Why is Bruce, after being separated from Kris for almost a year, still rocking his wedding band out and about? There has to be a good explanation for this. I mean, we all know that there's a lag between KUWTK seasons and the actual events that appear. Maybe Bruce had to wear his ring to film something from the upcoming season of the show and just forgot to take it off. Or MAYBE Bruce keeping his ring on will be a dramatic subplot for KUWTK's new season? Bruce is my favorite Jenner, so I still carry around a heaviness in my heart from when Kris refused to give him $20 during one of the early seasons. Bruce did everything she asked of him and she wouldn't even give him $20. It hurt me. That alone makes me anti-reconciliation, but Bruce obviously loved Kris very much (even if she treated him like her servant sometimes), so it's possible that they reconciled. Anything's possible if you just believe. This could just be a fashion statement on Bruce's part. Maybe Brody got him a funky ring during one of his travels and he accidentally put it on that finger or Bruce just DGAF and put it on that finger. You do you, Bruce. Another possibility, Bruce just really loves his wedding band. I mean, it probably cost him a pretty penny, so why would he not want to wear it? His marriage to Kris might be over, but that doesn't mean he can't rock his favorite ring. Bruce has a lot going on. He got his hair done before the concert, he's going through a divorce, and Kendall's parading down runways all over the world. Maybe Bruce just forgot to take his wedding ring off when he and Kris filed for divorce and, out of habit, he hasn't even noticed that he's still wearing it to this day. Bruce is a busy guy, he can't be bothered considering societal norms during every waking moment. God.